KTLA — A Redlands family on vacation in Hawaii on a boat tour on Monday when a huge chunk of molten rock from the Kilauea volcano struck the roof of the vessel. The Li family said they had been mesmerized by views on the tour until the so-called lava bomb suddenly hit, puncturing the roof of their boat and injuring 23 people. In video someone else on the boat captured of the moment, a loud crash is heard then all turns black amid terrified shrieks from those aboard the vessel. One witness told CNN the boat was covered in rocks, and some of those who got off once it docked had burns and gashes on their legs. One person was taken from the scene on a stretcher. “It was mayhem. You heard screaming and crying and just total — lava rock pelting us,” said Dawn Li, Kaming's wife. At least a dozen people were treated at a nearby hospital and released Monday. Kaming, a doctor, said he assisted one woman in her 20s was in serious condition with a fractured femur after tending to his family. The Li’s son Christopher’s leg calf has been bandaged to cover second- and third-degree burns. “I sustained burns to the side of my calf, as well as shins,” he explained. Christopher said he felt the boat was getting dangerously close to the volcano remembers mentioning this concern to his sister seconds before he saw an explosion. 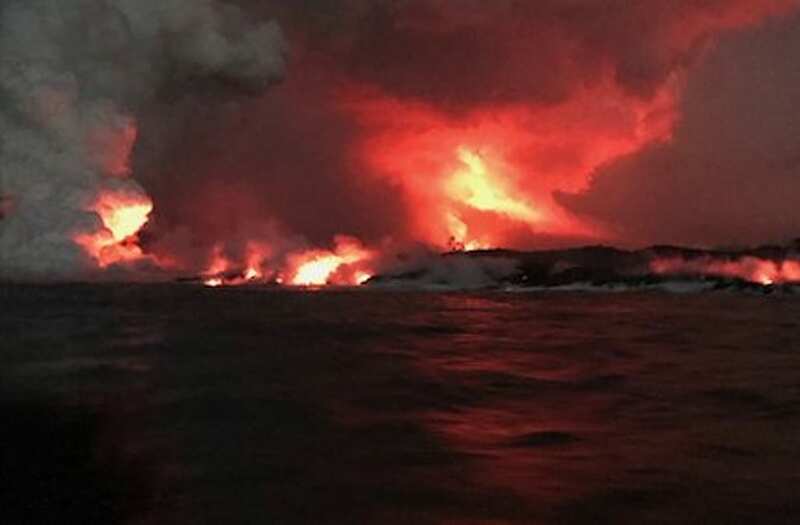 On Tuesday, the Coast Guard extended the required safety zone surrounding active lava flows in response to the incident. The Li family, meanwhile, said they would still stay and finish their summer vacation in Hawaii before returning to the Inland Empire at the end of the week.